Steep and sip tea on the go with this sturdy stainless steel tumbler that is double wall vacuum insulated and will keep drinks hot or cold for up to six hours. This travel mug has a patented built-in compartment to keep loose tea leaves and tea bags separate from your brew. 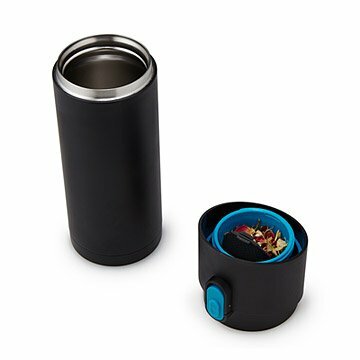 The tumbler has a lock button on the lid to prevent leaks while you tote your tea to the office or park. Made of stainless steel with a BPA-free ABS lid in China. Get to brewing with our Green Herbal Tea Kit and our Chai Tea Kit. And when done, easily clean your Insulated Tea Infusing Bottle with our Bottle Cleaning Beans - Set of 2. Have yet to use it, but it looks nifty! I bought this because I am an ice-water drinker, not because of the tea infuser. It turns out that the tea infuser "door" inside the container is perfect to block ice cubes from plugging the drinking hole when you tip the container back in order to drink. That's the good news. The bad news is that it does not have very good cold insulation and the ice cubes melt pretty quickly on a hot day. Turns out it's good for short trips in the car, but not 18 holes on a golf course. My partner likes ginger, clove and cinnamon tea. This has made everything so easy and he can now make his tea on the go. Got this for a friend who has everything but had never seen this. she thought it was great. Used once, didn't keep the tea hot and it showed wear first day. He loved the tea infuser. Product works well, but hard to open once it's full of tea. Exactly what my mom needed for making tea at work! This is a gift for my tea loving, health nut niece! It is perfect, she will love it!